A member of local tenants’ rights organization P.O.P.I.R. – Comité Logement and a resident of the neighbourhood since 2009, Viannay was among more than 100 protesters who marched through Montreal’s Sud-Ouest borough on Saturday demanding the construction of social housing. “Tenants are being driven out of the neighbourhood,” she said. “We have many elderly residents who have been living here for 20 or 30 years and they’re being forced out by property owners who want to convert their building into condos. The marchers were calling for 2,800 social housing units to be built in the Sud-Ouest, which they say would account for the families who spend half their income or more on rent. 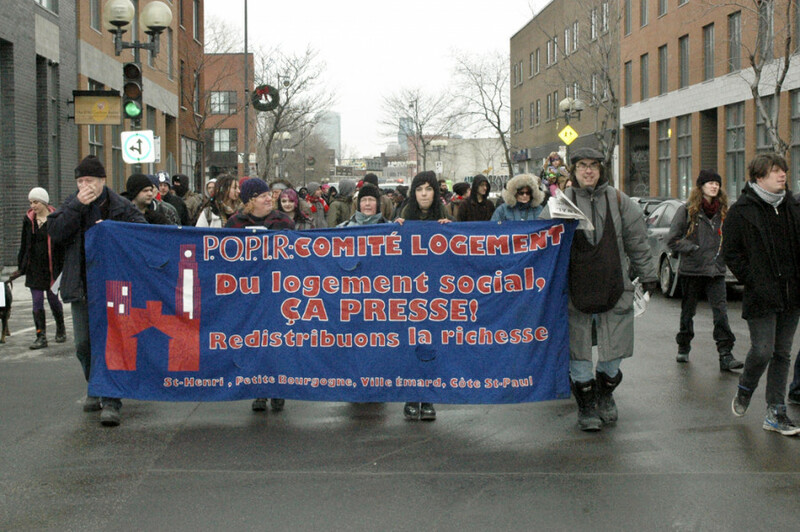 The protest was part of the Front d’action populaire en réaménagement urbaine’s campaign calling for 50,000 new subsidized housing units province-wide within the next five years. “There are many single people and families around here that need social housing,” said Alfred Thorne, who has lived on the other side of the Lachine Canal in Verdun for 25 years. Since he moved in, he says condos have changed the face of his neighbourhood as well. As the crowd cut across the neighbourhood walking along Notre-Dame St., event organizers pointed out new restaurants and shops that they described as symptoms of gentrification, including the luxury men’s barbershop Notorious. Open since September, the Versace-furnished salon is known for offering a $1,000 shave. Customers who pay top dollar can expect to be shaved with a gold razor, which is later dulled so that they can take it home. In an interview with The Link, Corey Shapiro, who co-owns Notorious with Patrick Gemayel, also known as P-Thugg from electro-pop group Chromeo, said shops like theirs benefit the neighbourhood. “What an ignorant thing to say that it’s bad to gentrify a ’hood that’s run-down,” said Shapiro. “We’re not a large corporation; we’re a hardworking artist and businessman, self-made from Montreal who have decided to inject money in an area. “People should want to better themselves. No one wants to stay in a run-down apartment with cockroaches and rats—no one,” he continued. “This is a neighbourhood shop that respects others. There’s something here for everyone,” he added, pointing out that the barbershop’s prices start at $15. 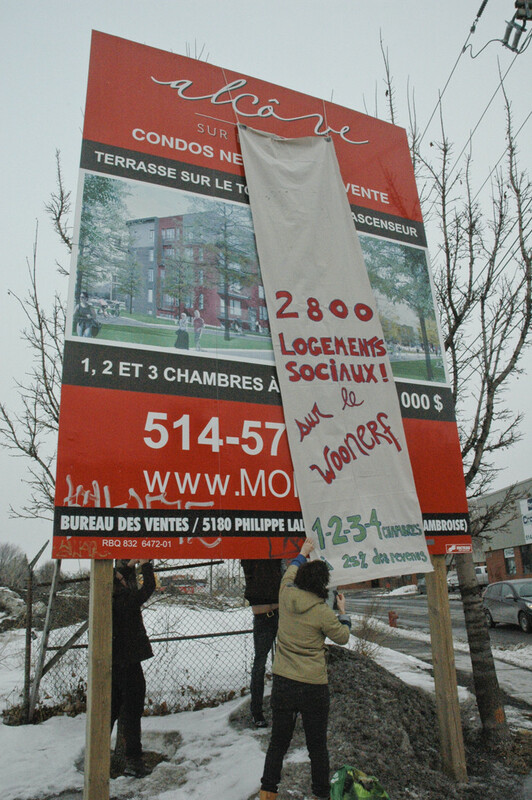 At the corner of St. Ambroise St. and St. Rémi St., the protesters stopped to drape a banner calling for social housing over a billboard advertising the L’Alcôve sur le Woonerf condo development. The price for a one-bedroom unit in the building starts at around $160,000. Pointing to the McGill University Health Centre superhospital construction site in the distance, Valérie Simard, a community organizer at P.O.P.I.R., said the condominiums are being built specifically for the doctors and nurses who’ll soon be working on the hill. Local residents and members of P.O.P.I.R. have long been rallying in opposition to the conversion of the defunct malt factory into a 600-unit condo complex. In December, protesters carrying homemade lanterns marched to the Sud-Ouest borough hall to deliver a petition with over 1,500 signatures asking that the factory be saved. Simard added that public investments in that part of St-Henri are being made to pave the way for more condos. After years of planning, the borough finally unveiled the Woonerf Saint-Pierre, a pedestrian-only “green” alleyway, in the fall. A protest against federal cuts to subsidized housing is planned for Feb. 9, two days before Canadian Finance Minister Jim Flaherty will deliver the 2014 budget. The federal government devotes $2 billion to social housing, down from $3.2 billion four years ago, according to The Montreal Gazette.